There are a variety of components – that can encapsulate business logic (either simple algorithm/calculations or even complex orchestrations). These components can be invoked from business process orchestrations as well as stateless services. These reusable components could be business rules integrated as decision services or legacy services wrapped using a more decoupled interface. Business events such as a new account being opened or a new security getting added to a portfolio could trigger a core piece of logic – e.g. get statement preferences – that can be used to fulfill both these needs. 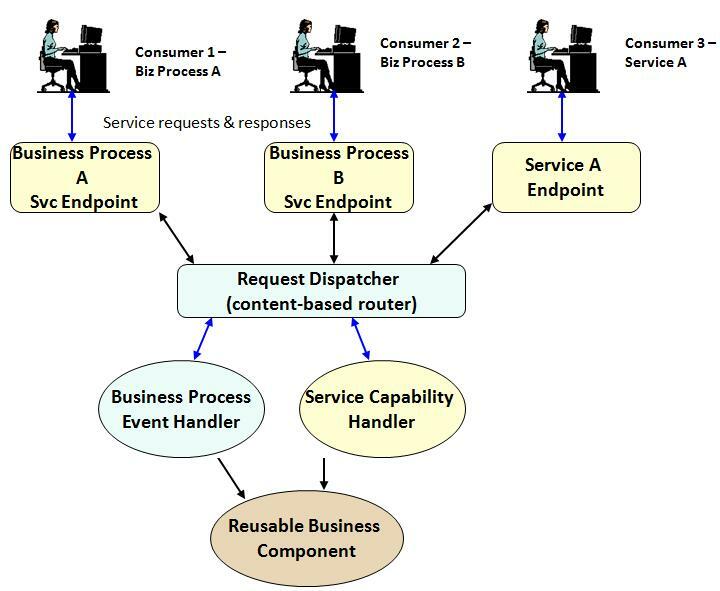 For instance, in the diagram below that two business processes and a stateless service invoke a common component via a request dispatcher (or a router module). If you tightly couple a piece of logic that is applicable across business processes or service capabilities you can refactor it to create a new resuable component. This is all the more reason why it is a good idea to go through a service mediation layer when leveraging legacy services from business processes. If you decide to reuse the legacy service in a new orchestration it will be straightforward to plugin a new consumer. This entry was posted on Monday, April 19th, 2010 at 8:20 pm and is filed under BPM, Design, Reuse, SOA. You can follow any responses to this entry through the RSS 2.0 feed. You can leave a response, or trackback from your own site.